The fog which had shrouded San Francisco for days gradually started to lift as we climbed Cathedral Hill, making the Cathedral of St. Mary of the Assumption ahead of us appear to almost float above the city. 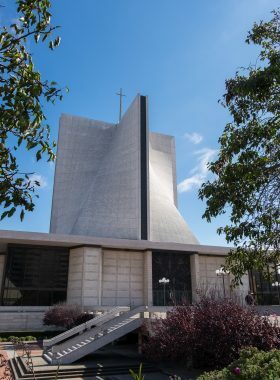 Taking inspiration from the cross, the architecture of the St. Mary’s Cathedral emphasizes both the vertical and the horizontal. As the eyes are drawn upward with the sweeping of the cupola, hearts are meant to lift up towards the heavens and God. 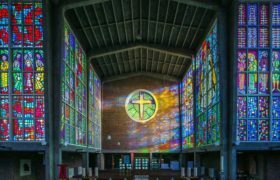 Set in spacious piazza, the cathedral’s striking modernist design flows from the geometric principle of the hyperbolic paraboloid, in which the structure curves upward in graceful lines from the four corners meeting in a cross. It was designed by local architects John Michael Lee, Paul A. Ryan and Angus McSweeney, collaborating with internationally known architects Pier Luigi Nervi and Pietro Belluschi — at the time, the Dean of the School of Architecture at MIT. Groundbreaking occurred in August of 1965 with construction being completed in 1970. Measuring 255 feet (77m) square, the cathedral soars to 190 feet high and is crowned with a 55 foot (16m) golden cross. Four corner pylons, each one designed to withstand ten million pounds of pressure, support the cupola, which rises 19 stories above the floor. What I especially loved about St. Mary’s was the cool cavernous interior which seemed to create an atmosphere of almost meditative peace. Vast windows look out upon spectacular views of San Francisco. 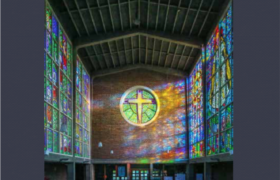 The stained glass is the most striking I have ever seen, in particular the narrow linear sections which rise steeping from the four compass points to form a bold cross which soars above the sanctuary floor. A kinetic sculpture by Richard Lippold is suspended fifteen stories off the ground by gold wires. The red brick floor recalls early Mission architecture and the rich heritage of the local church. 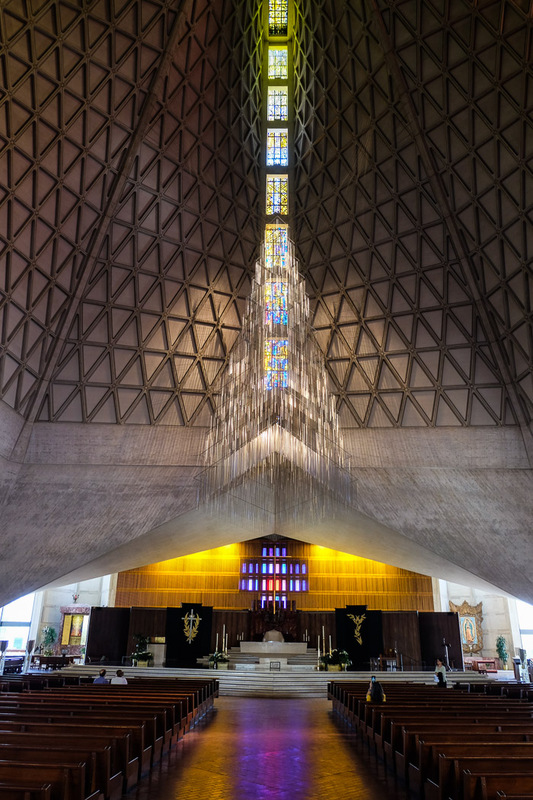 The design is said to be reminiscent of St. Mary’s Cathedral in Tokyo, which was built earlier in the decade by Kenzo Tange. The building was selected in 2007 by the local chapter of the American Institute of Architects for a list of San Francisco’s top 25 buildings and is said to be one of San Francisco’s best-loved structures. However, it was notable by its absence in most of the guide books I consulted while planning my trip to the city and it was virtually deserted when we visited. 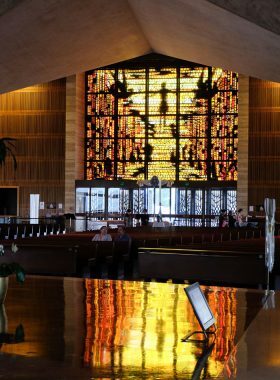 So let’s hope this write up encourages more people to visit this modernist gem when they are next in San Francisco. You will not be disappointed.